Tonight we get another exciting week of Tag Team wrestling, as the final four teams square off to decide the finals of the Dusty Rhodes Tag Team Classic. Along with that, we are getting the #1 Contender’s Match between Io Shirai and Bianca Belair. It certainly will be an action packed week of NXT action. The clear favorite going into this match was Moustache Mountain. The fans were behind them, they have history with the NXT Tag Team Titles, and clearly Tyler Bate is a major star here in both NXT brands. The Forgotten Sons have shown up lately though, and haven given us quite a few reasons to not forget them. We often forget that Wesley Blake was an NXT Tag Team Champion, having a pretty dominant reign with WWE Cruiserweight Champion Buddy Murphy. Blake showed a very methodical, technical style while working on Trent Seven’s bad knee. Tyler Bate had a good run after himself and Blake both got the hot tag. Really cool spot where Bate put both Blake and Cutler on his shoulders for an airplane spin, followed by an even cooler double hurricarana. Jaxson Ryker finally got himself involved, putting Cutler’s foot on the rope to avoid pinfall. He also ultimately took out Tyler Bate outside of the ring when the referee was inadvertently hit. This lead to Bate being thrown to the ring to be put away for the 3-Count. It was about time for Jaxson Ryker to get involved. I have been surprised watching them over the past few months. Ryker is a huge wildcard leading into the finals, as we really haven’t seen his power displayed too much, especially in interference. Are they holding onto this until the finals? Or maybe for their potential matchup against War Raiders. Riddle is interviewed backstage asking why he came out to interrupt the Velveteen Dream. He was quickly interrupted by Adam Cole. A little back and forth, which leads to Matt Riddle challenging Adam Cole to a match. We get Shayna Baszler on commentary for this match, as she basically dumps on both of the opponents. Io Shirai is apparently a nobody, and Bianca Belair has done nothing to belong here. Shayna is getting really good on the mic, and is clearly beyond confident as a champion. Bianca seems much more confident playing the heel in this match, and I have to agree, she is much more natural in that role. The crowd is clearly behind Io in this match, but Bianca isn’t letting it get to her. Belair’s power game is outstanding, and she even nailed a very impressive standing moonsault. Io was just as impressive with her aerial moves. Belair stopped Io’s momentum, getting her caught up in the tree-of-woe and nailing a hair whip to Shirai’s midsection. No scar this time, but still sounds painful! Belair nailed Shirai with a spear, and with both competitors down Baszler ran down and ruined the match. While she was choking out Belair, Kairi Sane came in to make the save, inevitably getting herself choked out. Shirai came in and made the save, only to get herself choked out, as Baszler was the last Woman standing. All signs are pointing to a Fatal Four-way at this point, as the crowd boos Baszler as she stands above the four fallen ladies holding her NXT Women’s Championship up high. Hopefully William Regal will chime in soon to give us an answer. Quick clip of Keith Lee vs. Dominik Dijakovic from two weeks ago. I am still heavily anticipating next week’s rematch. NXT does a great job in teasing us for a regular TV match. If only Raw and Smackdown were able to do this! We have been anticipating this match for almost three weeks. Backstage interview with Shayna Baszler. Baszler said that there isn’t a single woman in the back that deserves a title shot. Apparently William Regal agreed (and agreed with me too) as he announced that at NXT Takeover: New York, Baszler will meet Shirai, Sane and Belair in a Fatal Four Way. That match has a lot of potential. #DIY coming out rocking their vintage #DIY T-Shirts. This should be a good one, as the chemistry between Ricochet and Black has been growing as they have been teaming up on the main roster. However, while we talk about chemistry, #DIY has been on fire since joining forces. They even have their #DIY matching attire this week. There was an amazing segment between Ricochet and Gargano. They picked up where they left off at Takeover: Phoenix. A lot of counters, and fakes, ultimately resulting in Ricochet getting Gargano out of the ring, as he and Black faked the suicide dive and sat in the middle of the ring. Mauro made a comment about how well Gargano and Ciampa worked together, likening it to getting back on a bicycle. I couldn’t have agreed more, I feel like these two could tag together, and feud for another two years, only to tag again. Ricochet took a beating for what seemed like forever, as Gargano and Ciampa kept him away from Black and broke him down. Eventually he got to Black, as he made the comeback for his team. Ciampa hit Black with a really nasty looking Tower of London on the apron, which lead to Black being put in the Gargano escape. 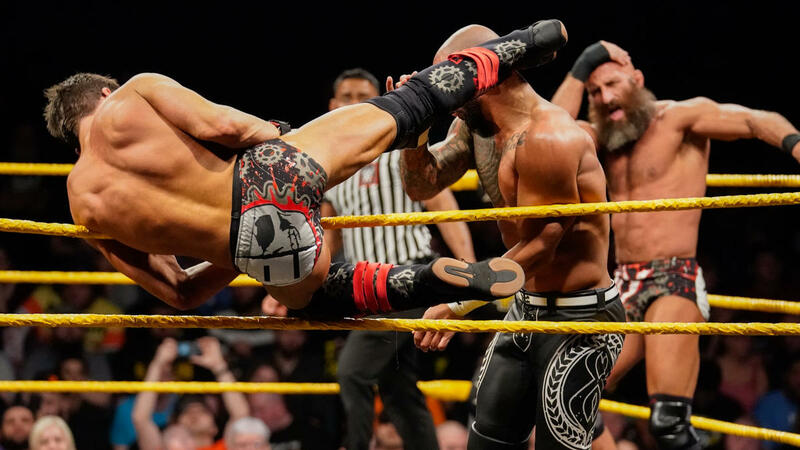 At the same time Ciampa got Ricochet locked in a submission, and it looked like we were going to get a poetic repeat of when #DIY won their NXT Tag Team Championship. Ricochet broke it up, and looks like he hurt Gargano’s knee. Johnny Wrestling rolled out of the ring, as Ciampa looked on concerned. Ciampa went to the corner to make the tag, but Gargano was still on the floor. Ciampa ended up with a Black Mass, and a 630 Splash, as Ricochet and Aleister Black score the pinfall and a ticket to the Dusty Rhodes Tag Team Classic Finals in two weeks. It was after the match though, that the true story was told. The story that seems to never end, and I am 100% ok with it. Candice LaRae ran down to check on Johnny. Ciampa came down to help too, which Candice seemed really unsure about. In a scene that looked eerily similar to Takeover: Chicago, Ciampa went to throw Gargano into the stage, however, Gargano seemed to be playing possum, as that knee was doing just fine. Ciampa ended up being the one thrown into the stage, and received a superkick as well. NXT goes off the air as we see a huge smile on Johnny and Candice’s faces. Johnny Gargano for sure. I have been waiting since Gargano and Ciampa joined forces at NXT Takeover: Phoenix for this to go down. While it isn’t exactly how I predicted, NXT Takeover: New York looks like it was supposed to be Main Evented by Gargano vs Ciampa. However, it looks like Ciampa’s injury puts a little kink into the plans. In the coming weeks it is expected that Ciampa will have to relinquish the NXT Championship. The question will be, will Johnny Wrestling finally get his fairy tale ending? Or will someone else get the run. We will have to wait until next week to get that answer though! Until then, continue to visit us here at Jobberknocker.com as well as follow me on Twitter as @TJoftheJK .